In June 1990, Karin White of Glenwood Springs, Colo., and Chick Overington of Southhampton, Penn., met at the National Senior Symphony, performing that year at Mystic, Conn. Mr. Overington was planning to semi-retire and move to the West, and Ms. White suggested he consider the Roaring Fork Valley in western Colorado. She told him it was a nice place to live, work, ski and perform with other musicians. When Mr. Overington moved to Carbondale in the fall of 1991, he asked Ms. White why there was no community orchestra. Together, they decided it was time to establish an orchestra. Ms. White knew many local musicians, and Mr. Overington had served as a board member and violin player in the Warminster Symphony in Pennsylvania. Their collaboration resulted in the birth of Symphony in the Valley in 1993. Mr. Overington and Ms. White recruited Jon Madsen and Randy Fox as the co-conductors, and placed announcements in community newspapers in the summer of 1993 seeking players. The first concert was performed on Wednesday, Dec. 8, 1993, to a packed house in the Glenwood Springs High School Auditorium. The fledgling orchestra had 42 members and performed works by Grieg, Haydn, Corelli and Leroy Anderson. Wendy Larson, a cellist, became the orchestra’s co-conductor in 1994 after Mr. Fox moved away. Mr. Madsen left the orchestra in 1997 after he was diagnosed with cancer, and passed away in 1998. Losing Madsen and his generous spirit was painful and sad for the orchestra. As a tribute, the orchestra established the Jon Madsen Memorial Scholarship. M s. Larson led the orchestra for 11 seasons. Her creative thinking resulted in many memorable concerts. “Hits of the 20th Century” and “100 Years of Broadway” reprised the turn of the new century. Children’s concerts featured Tubby the Tuba, Carnival of the Animals and Peter and the Wolf. “Familiar Classics” offered snippets of well-known classical themes, with costumed conductors. 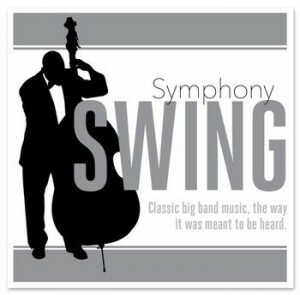 And the Symphony Swing dinner dances and concerts revived live big band music. Collaborations with Wendy’s wide circle of friends in music put a sparkle in many performances. She teamed up with Aspen hardrock miner Jay Parker, who supplied the cannon fire for the 1812 Overture, performed outdoors in 2005. It was a one-of-a-kind musical blast. In October 2006 the orchestra played the annual John Denver Tribute concert at the Wheeler Opera House in Aspen with Denver’s former band. In May 2007, the orchestra and guest singers performed excerpts from the opera Carmina Burana. In 2008, Ms. Larson stepped down from the position and the orchestra hired Carlos Elias, director of the strings and orchestra program at Colorado Mesa University in Grand Junction, Colo., and concertmaster of the Grand Junction Symphony Orchestra. Mr. Elias led the orchestra for five seasons. He left the position in the summer of 2013 to take a new job with the music faculty at Cedarville University in Cedarville, Ohio. In the fall of 2013, Symphony in the Valley hired Kelly Thompson to be the new Music Director. 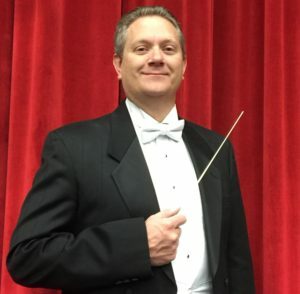 Kelly joined the Symphony for the 2001-2002 season and has performed myriad duties with the organization over the years including playing trumpet and percussion, singing, helping with the behind-the-scenes direction as President of the Symphony Board, and leading the group as a frequent guest conductor. He has been the Music Director for the annual Symphony Swing event since 2011. The years have brought many changes and many accomplishments. The concert season: The orchestra typically performs twin concerts in Glenwood Springs and Rifle, Colorado in the months of October, December, February, May, as well as an Independence Day concert in July. Symphony Swing: In February or March: Symphony in the Valley and its Big Band put on the orchestra’s annual fundraising event, a dinner dance featuring live Big Band music played by the full orchestra and by Big Band ensembles. Tickets for this event go on sale in early December. Tickets: In 2000, the orchestra noted a “suggested donation” for those attending the concerts. In 2002, Symphony in the Valley began charging admission to concerts. Music students of all ages are admitted free. Concerto Competition: In 2004, conductor Wendy Larson and orchestra manager Marice Doll launched the Young Artists Concerto Competition. Musicians up to age 30 may enter the competition, which is held in January. Contestants perform a selected piece, with a piano accompaniment if they wish. Junior and senior division winners are chosen by independent judges. The top young musicians are then invited to perform their competition selection with the orchestra for the Mother’s Day Concerts in May.